A few years ago, I started putting stickers on the backside of my laptop. When I worked at Deltek’s GovWin, we were trying to find a way to get our members to talk to each other and network. GovWin is a networking and business tool that was originally conceived as a “dating network” to get large government contractors to partner with smaller contractors to do business. Yet, government contracting expos tend to be more about who you know and not really a place to brand yourself but a way to sell your company, its past performance and its capabilities. In some ways, it’s not unlike a healthcare fair at a local school. Dull but necessary. The goal was to get more people to sign up for the free service and start networking at these expos. And a healthcare fair-like scenario with a lot of speeches or presentations wasn’t conducive for our goals. I snuck into a session and noticed that all the participants were on their laptops on big round tables. For the next expo, we created a simple sticker that identified the laptop’s owner as a GovWin member. 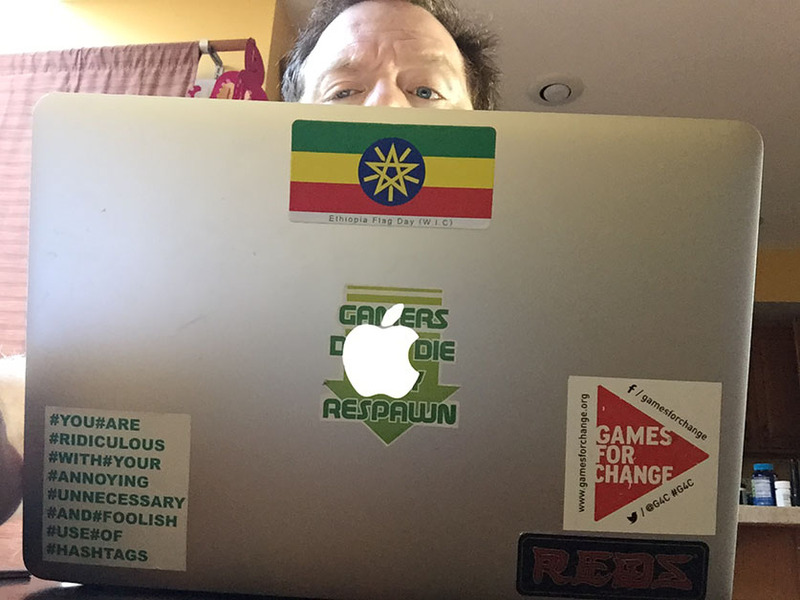 If I could get a sticker on the back of a laptop for several 45-60 minute sessions, everyone on the table would notice that they weren’t a cool kid without that sticker. For current members, we’d simply verify their status on the network and give them a sticker. For those who weren’t, they’d signup in the booth and get a sticker. It was a way to tell people that they were ready to do business. From all reports, we ran out of stickers. Not too long ago, I noticed more stickers on other laptops and I named the practice “laptags” as way to merge those who continue to rely on their laptops and their stickers as real-world social media-like hashtags. There’s no best practices for how, where or how to professionally “laptag” your laptop but I’ve seen some great use of custom stickers informing people of the user’s Twitter handle, a Windows sticker on the back of a Mac (they were dual booting), a Slack logo and several tags used for cybersecurity. Laptagging might be viewed like NASCAR logos for the professional world. There will be those who love them and those who will hate them. Yet, there are several people that I have spoken to who feel that, like the current critical view that LinkedIn is becoming too much like Facebook with more personal messages than professional ones. Most of the execs that I have met, often have sticker-less laptop (often their work rigs) and their personal devices are, for the most part, sticker-less as well. I’ll admit that I have yet to come across an exec who said anything negative about the practice. But it is something to think about as a marketing person. When people align with a brand or product, a laptag can be a very effective marketing technique for the company’s brand as well as an amazing networking tool. 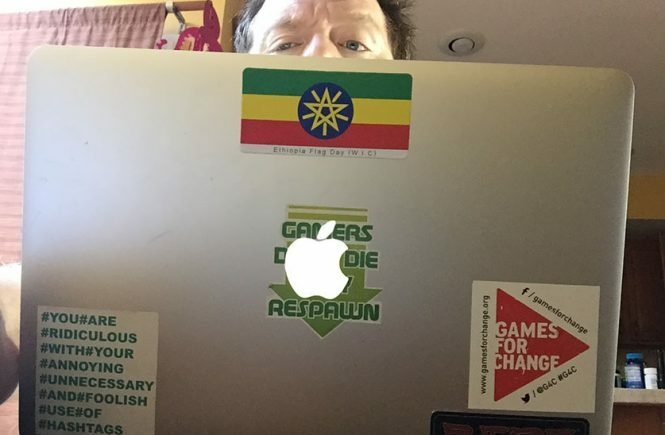 Currently my laptop has five stickers: one jokes about the overuse of hashtags, one promotes GamesForChange, one’s a funny gamer joke, one is a cool sticker for Reds (very nice ball bearings for my roller skates) and an Ethiopian flag (my daughter’s birth country). The flag one has stopped complete strangers to chat for a few minutes, scored me a free cookie once and improved my service at a local restaurant where I frequently used my laptop. Given that I worked in DC, where the highest population of Ethiopians reside outside of Ethiopia, it’s not a surprise. The point is that I am going to experiment as I search for a new job. Can a few laptop stickers help get me land a new role? We’ll just have to see. For now, laptag if you want. Think of them like tattoos that you can remove without lasers.